Victoria is ramping up its lobbying efforts to become the home of Australia’s space agency with the launch of a new campaign promoting the state’s thriving space industry. Talking up Victoria’s aerospace capabilities at the Swinburne University of Technology, Minister for Industry and Employment Ben Carroll said Victoria was the ideal home for the new agency, with more than one-in-five Australian space-related science and technology companies based in the State. The Minister, who was joined by Victorian Lead Scientist Dr Amanda Caples and Associate Professor Alan Duffy, pointed out that some of the world’s biggest names in aerospace – including Lockheed Martin, Thales, Boeing and BAE Systems – carry out aerospace research, development and manufacturing in Victoria. “Global companies like Lockheed Martin and Boeing have already seen Victoria’s economic and jobs growth potential in this industry,” Mr Carroll noted. Ms Caples said Victoria is well positioned both commercially and geographically to be the physical centre and a focal point for coordinating national and international collaboration on space and attracting global investment. 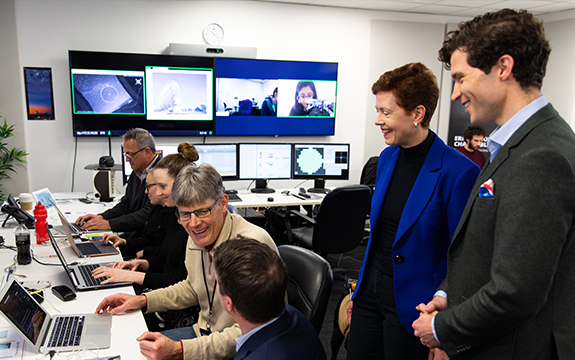 “Victoria is at the forefront of research, engineering and advanced manufacturing in the areas of aerospace, satellite communications, cybersecurity and spatial information for both the civil and defence industries,” she added. Swinburne University of Technology Associate Professor Alan Duffy said the State has a proud legacy of world-class advanced manufacturing, as well as the key universities and industry R&D collaborations in data science and AI to best use that data from space. He pointed out that the University has entered into a unique partnership agreement with the California Institute of Technology, giving it access and the ability to control the Keck telescopes with a direct video link from an on-campus control room. “Our state is ready to support the growth of the Australian space industry that operates on a global scale and beyond,” he concluded.